The best of these schools, like the TEAM Academy in Newark, are miracles in our midst. With the same demographic mix of students as district schools, their kids are doing much better in basic skills. And they are doing it for less money, in a setting that is safe and orderly. Nearly every phrase in this statement is misleading or simply wrong. And that’s a shame. My apologies for being trapped in meetings yesterday and not having a chance to return calls on this topic. I might have been able to head this off. Perhaps most disturbingly, this stuff really doesn’t help out TEAM Academy much either. Readers of my blog know that I often go after stories about the high flying Newark and Jersey City charters which, for the most part, stick out like sore thumbs when it comes to demographics and attrition. Readers also realize that it is not that I think these schools are doing a bad job. Rather, I think many are doing a great service. But, I am concerned that the media often deceives the public into believing that the “successes” of schools like North Star and Robert Treat can be scaled up to improve the entire system, which they cannot, because they simply do not serve students like those in the rest of the system. My readers also know that I’ve generally left TEAM Academy alone here, and for a few reasons. First, TEAM’s demographics are less extreme outliers than those of the other high flyers. Second, TEAM’s outcomes are also more modest, but pretty good. Third, and perhaps this is revealing of preferential treatment on my part, but the head of TEAM, Ryan Hill has always been one for open and honest conversation on these very topics – perhaps because he understands fully that I’m not out to get him, or any other charter leaders here. Rather, I’m out to paint a realistic picture of what’s going on. So, here I’m going to paint a realistic picture of TEAM Academy. This is not criticism. It’s realism. And again, I do appreciate Ryan Hill’s efforts and TEAM’s role in the Newark community. That’s why I think the above statement is so irresponsible. It sets an inappropriate bar and casts TEAM in an inappropriate light. It’s not a miracle. It doesn’t serve the same population. It spends quite a bit (but spending is all relative) and pays its teachers particularly well. While TEAM has a much higher classification rate than other “high-flying” Newark charters, its total rate is still much lower than Newark Public Schools. Further, we have no information on the enrollment of children with severe disabilities. 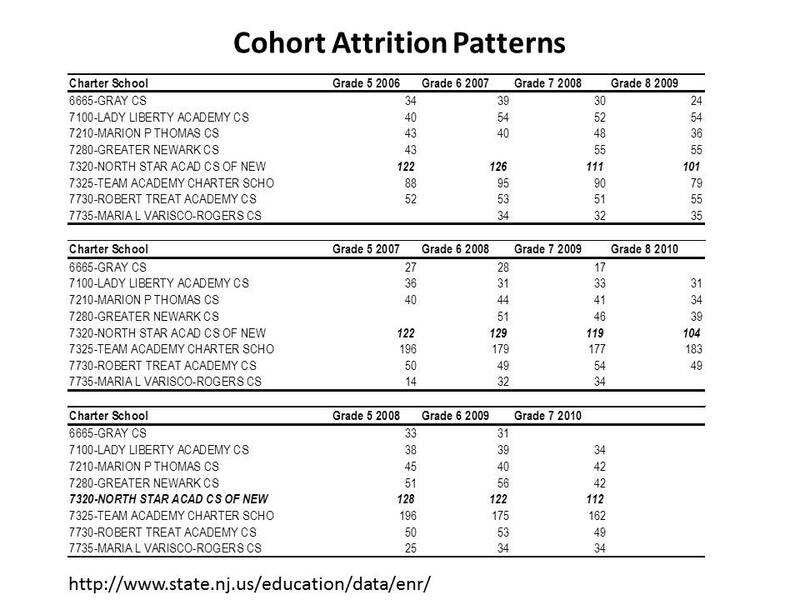 Second, here are the cohort attrition rates for Newark charters. Indeed TEAM has lower attrition than some, but still shows significant attrition from year to year (old slide, so North Star is highlighted). We don’t know much about the nature of that attrition, nor can these data tell us about it. It is important to understand that this figure may not be a full representation of what TEAM spends. It does not include additional expenditures on school activities by the national KIPP organization under which TEAM operates (which may include professional development, instructional materials, other gifts/stipends, etc.). It is critically important to understand that this figure is not directly comparable to NPS total district budget per pupil for many reasons. 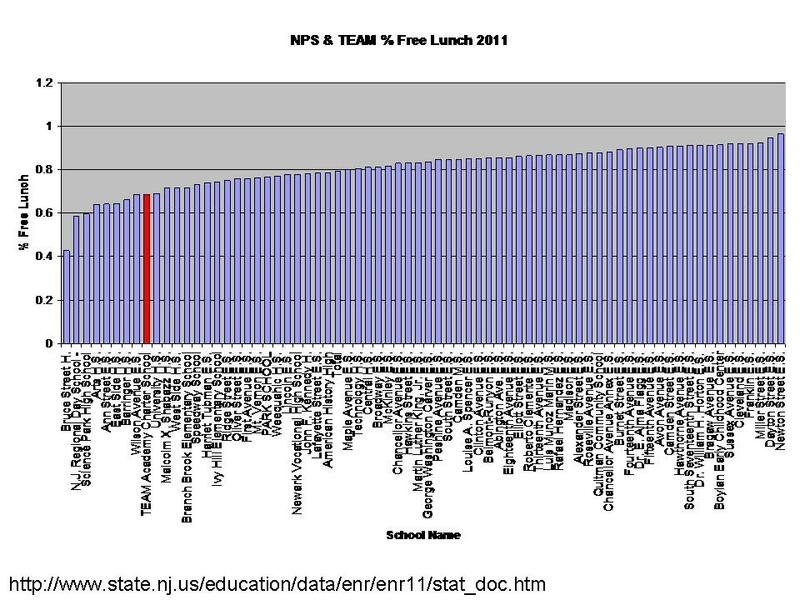 NJDOE data for making such comparisons are problematic in a number of ways, and newly revised data are no better than the older data. This figure would need to be compared with an appropriate school site expenditure figure for NPS schools serving similar grade levels and populations. For example, NPS district expenditures include the expenditures for transportation of charter students (which should be added to charter expense, not counted on host district expense). Further, one must acknowledge that since TEAM serves a far fewer children with disabilities than the district, especially those with more severe disabilities, TEAMs per pupil costs are lower. Note that spending on children with disabilities often consumes about 25% of district budgets (to serve about 14 to 16% of children, on average). * Appropriate comparisons would include relevant facilities expenses (annualized) for both charter and host. * I wrote extensively about the complexities of making similar comparisons in NYC last winter: http://nepc.colorado.edu/publication/NYC-charter-disparities And I continue to work on this topic, as it applies to NJ districts and charter schools. There should be no shame in trying to spend enough money to actually provide a decent education! It is twisted logic to assume otherwise! And the Star Ledger editorial ignorantly advances this twisted logic. There’s no shame in doing more with more or even similar levels of resources (if that is indeed what’s happening). Here are some insights into how TEAM spends. Many pundits these days talk about how we shouldn’t be throwing so much money at those already overpaid teachers. 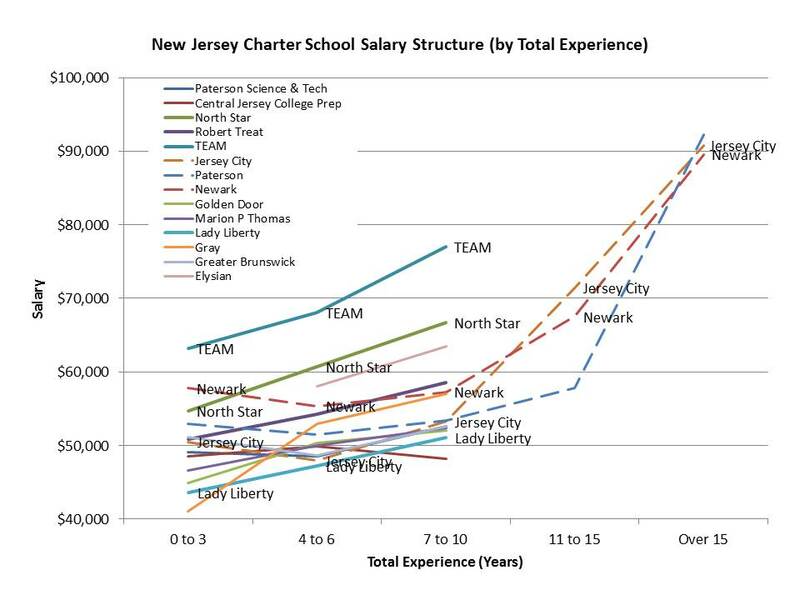 Well, here’s how TEAM Academy’s salaries stack up against some nearby public districts and against some other charters. 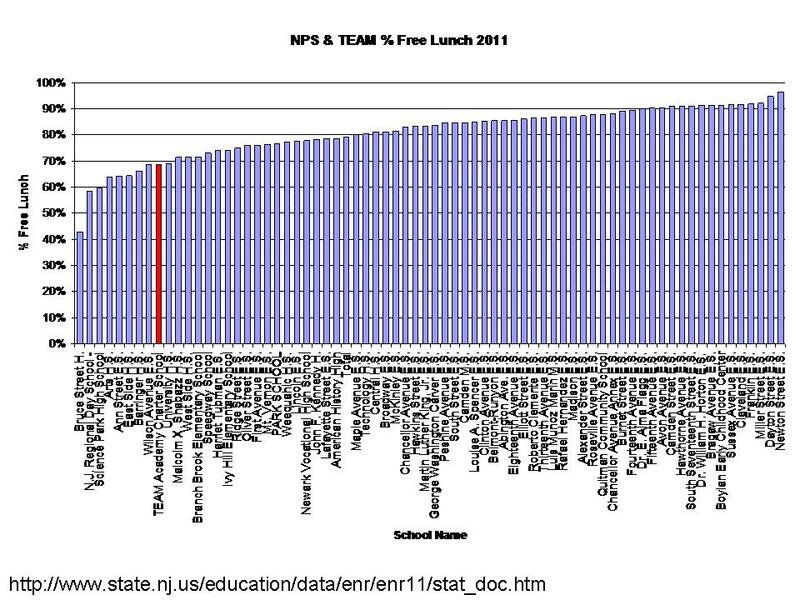 This is an unfinished analysis, based on actual individual teacher salaries from a statewide database. TEAM has strategically, I would argue, put itself in a position to recruit top new teaching candidates on the front end and scaled up salaries to retain teachers who’ve made it past those rough first few years. Yes, TEAM is leveraging its resources to pay competitive wages (something not so hip and cool in today’s reformy rhetoric), which I would argue is a smart move. And, in the Newark context it’s not a difficult move because the NPS district salary schedule is so flat on the front end. It’s easy to beat. And relative salaries matter. Indeed, TEAM has placed more value on early-mid career than late career, but it’s not that TEAM reduces salaries for later career teachers, but rather that TEAM salaries climb earlier. As of now, TEAM doesn’t have many “senior” teachers, partly because it hasn’t been around that long. It’s not a miracle but it just may be a pretty good school. It doesn’t serve the same population, but serves more similar population than many other high-flying charters. It spends quite a bit and pays its teachers particularly well, but structures that pay differently. So, that’s my “real” TEAM story – at least in data terms. I assume Ryan Hill can provide some insights from the trenches (perhaps while humming this catchy tune: http://www.youtube.com/watch?v=gQjFHxJ9IKs)! 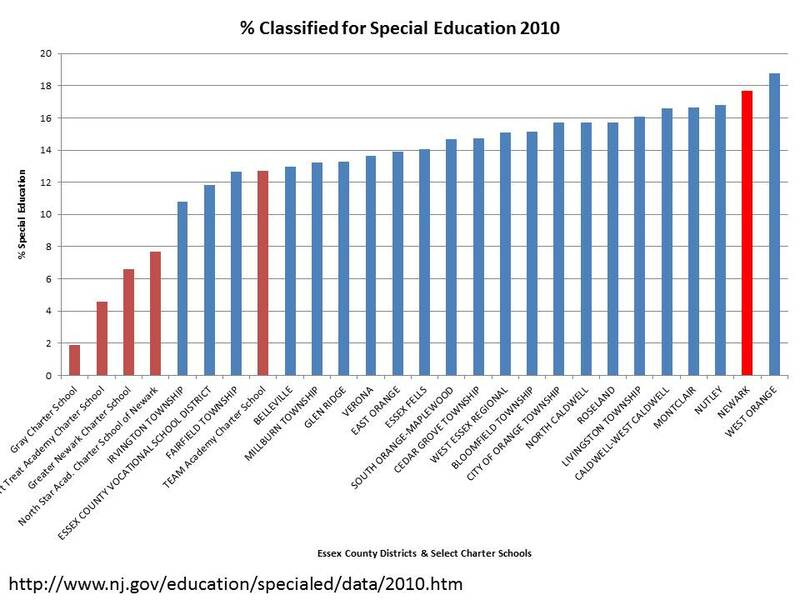 *For example, special education costs per pupil within a district budget that spends $20,000 per pupil might be $5,000 per pupil, or 25% (based specifically on analysis of special education expenditures in Connecticut districts). In New York City, the Independent Budget Office (see my NEPC report on charter spending above) estimated occupancy costs for facilities to be approximately $2,700 per pupil. That is to say, on balance, the differences in district special education population costs (relative to Charter special education costs) would typically more than offset differences in facilities costs per pupil, assuming district schools have $0 facilities costs (which is an extreme, incorrect assumption). 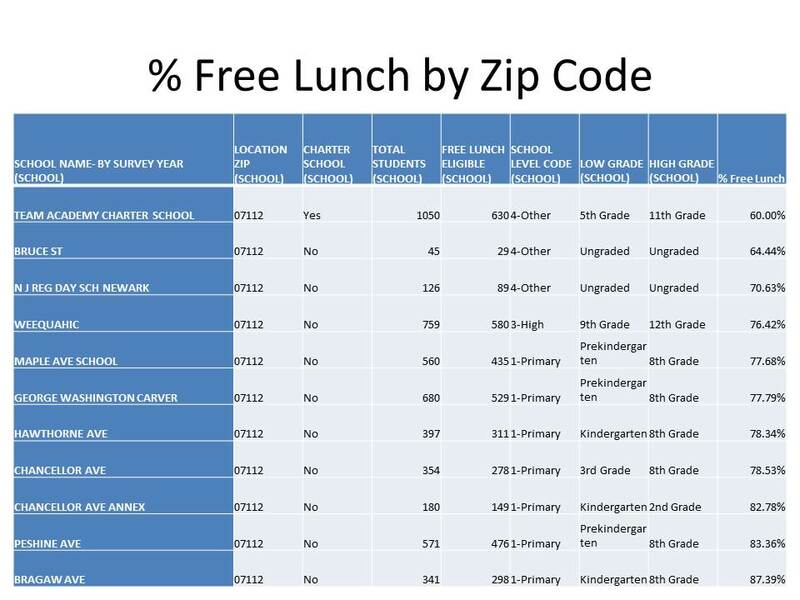 1) I’ve used schoolwide % free lunch here instead of test taker % free or reduced lunch because, as I’ve explained numerous times before, the vast majority of Newark families fall below the 185% income threshold and qualify for at least reduced price lunch. As such, that measure captures little or no difference across schools. 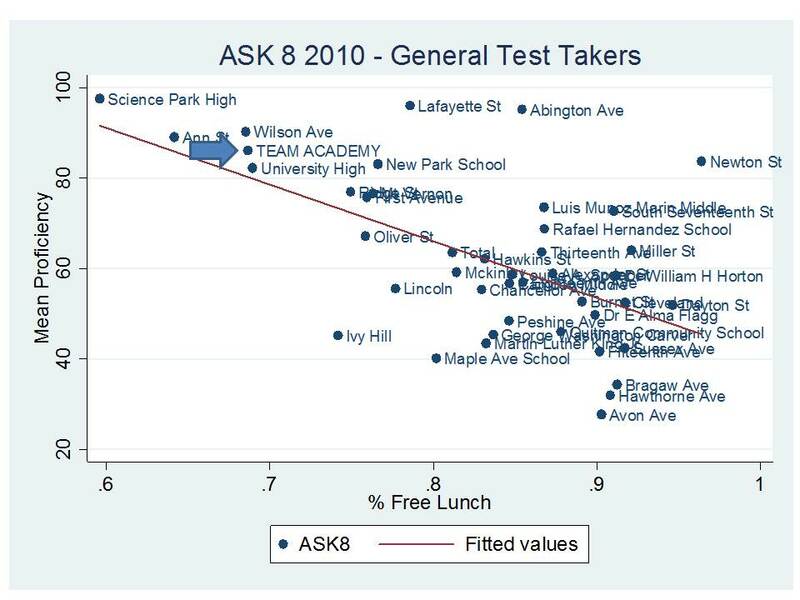 But there are differences, and those differences are captured by looking at the lower income threshold for reduced price lunch. 2) Because charter schools including TEAM serve so many fewer children with disabilities and few or no children with severe disabilities, one must compare the proficiency rates of GENERAL test takers only. If, for example, a host district has 10% more kids with disabilities and those kids are invariably non-proficient, that’s a 10% proficiency difference to begin with. In these figures, I’m considering only low income concentrations with respect to outcomes. On that basis alone, TEAM is marginally above expectations a) overall, and b) on most grade level assessments. 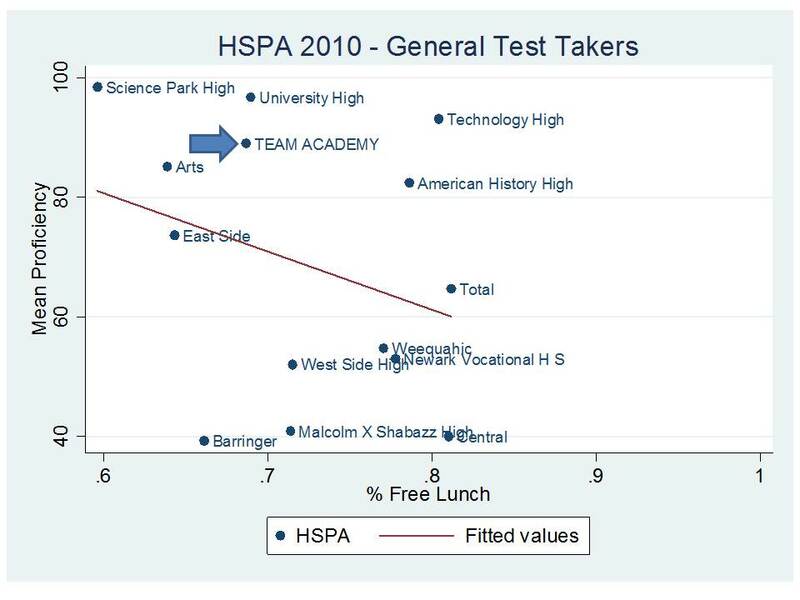 On the high school assessment, TEAM does somewhat better, but schools are pretty much scattered all over the place. It’s a solid school, but no miracles. Previous Rating Ed Schools by Student Outcome Data? Not a data question, but a critical point is the instruction and curriculum and the in-school assessign. Charters like regular publics are subject to the over-testing required. Many of both have succumbed to looking far too much like test-prep programs. Some resist, some create the programs that provide a real education. Hope TEAM is the latter.